This is an unofficial site about the live action movie adaptation of Gears of War, the Xbox 360 video game created by Epic Games. Dedicated to everything new on this upcoming project, we support the cause, providing it doesn't turn into a terrible hollywood betrayal. 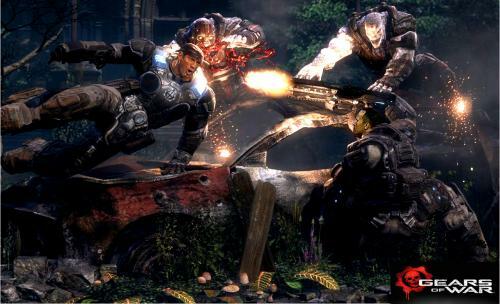 The Gears of War movie adap­ta­tion has been pretty quiet of recent. In April this year rumors that pro­duc­tion on a Gears of War movie had slowed down kicked up again–this time from New Line stu­dio sources (as reported by LATimes). Reports sug­gested the sto­ry­line and bud­get were being dra­mat­i­cally scaled back and that Len Wise­man would be focussing on other projects, namely Noc­ture. The orig­i­nal bud­get was expected to be around $100m, it is now thought to be con­sid­er­ably less. The script by Chris Mor­gan (“Wanted”) had a lot of buzz around it, and was tweaked late last year by Billy Ray, which included a lot of char­ac­ter work. Reports were good, a sprawl­ing and epic action movie. The change to the bud­get how­ever makes the film much less epic, and much more a sim­ple inva­sion story. With this in mind, New Line are search­ing for writ­ers to make these changes. Until this is ready, pro­duc­tion is stalled. Wise­man has now been attached to the Total Recall remake, and will almost cer­tainly not be direct­ing the Gears movie. Add to this that Kate Beck­in­sale is his wife, and we’ve lost our only cast member. What now for the Gears of War movie? A 2012 release? A low bud­get action film? Just as I cast my doubts on the pro­duc­tion of the Gears of War movie, it rears its head at this year’s SDCC with a panel fea­tur­ing Len Wise­man (direc­tor) and Chris Mor­gan (writer, Wanted). Pro­duc­tion is still in the ear­li­est stages, but more importantly—it is still in pro­duc­tion. How early? No con­cept art, cast­ing or pro­duc­tion stills yet. Wise­man and Mor­gan did how­ever offer up their thoughts on the adaptation. Changes may include female COGs. News has been slow, and that’s an under­state­ment — it’s been almost a year. I apol­o­gize that the con­tent of the blog hasn’t been updated more often, but the truth of it is, there hasn’t been any news. The Gears of War movie has slipped into pro­duc­tion hell; we can only spec­u­late as to why — inter­est, finance and sched­ul­ing are some of the biggest contenders. The video game adap­ta­tion as such is still in very early stages, despite hav­ing announced that Len Wise­man would direct; news that may no longer hold true given the length of time since the last update. We cer­tainly won’t be meet­ing the rumored 2010 Sum­mer release date, if pro­duc­tion ramped up this com­ing Jan­u­ary the best we could hope for is Spring 2011. To lighten the mood a lit­tle I give you some fan art pro­duced by Brian Speer, depict­ing Batista as Mar­cus and also fea­tur­ing The Rock, inevitably, com­ments on this post will now turn into a cast­ing discussion. 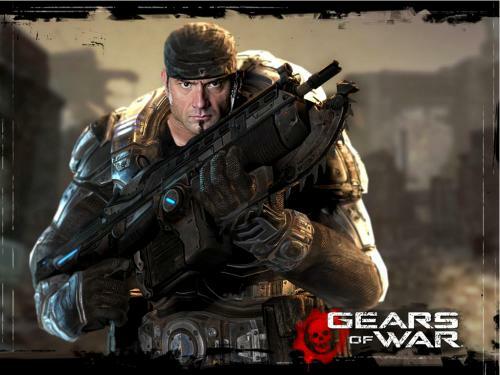 Len Wise­man is suit­ing up to direct New Line’s “Gears of War,” based on Microsoft and Epic Games’ hit vidgame. Fan­boys have been spec­u­lat­ing for nearly a year that Wise­man may helm the project; the game was fea­tured in his most recent pic, “Live Free or Die Hard.” But talks with New Line took place only over the last sev­eral months. Wise­man will develop the story with Morgan. I think the gen­eral con­sen­sus, from when Wise­man was pre­vi­ously rumored, was that he is a bad choice of direc­tor. Bring­ing in Chris Mor­gan, some­one that has worked on Fast and the Furi­ous 3 and lit­tle that is crit­i­cally acclaimed, sug­gests that the cre­ative minds behind this are want­ing to cre­ate an action-filled no brainer, with the major­ity of thought going into cool-looking CG action sequences rather than sto­ry­line and plot arcs. This news could poten­tially spell out doom (no pun intended) for the movie, con­demn­ing it to the world of low brow over the top action flicks. Gears surely deserves better. … in case you some­how missed it, which I can scarcely believe. Thanks Damien for send­ing this one in.